Show your Panther Pride while you drive with a PSU decal license plate! You can obtain your decal by making a 100% tax deductible gift of $55 or more to support NH Students through our Granite Guarantee! Order your decal online — choose between the PSU logo or the Panther mascot. Obtain your decal-ready license plate from the NH DMV. If you are transferring an existing passenger plate, visit any DMV location. For a new plate you must visit your local town/city clerk office. Note: decals can only be placed on decal license plates. 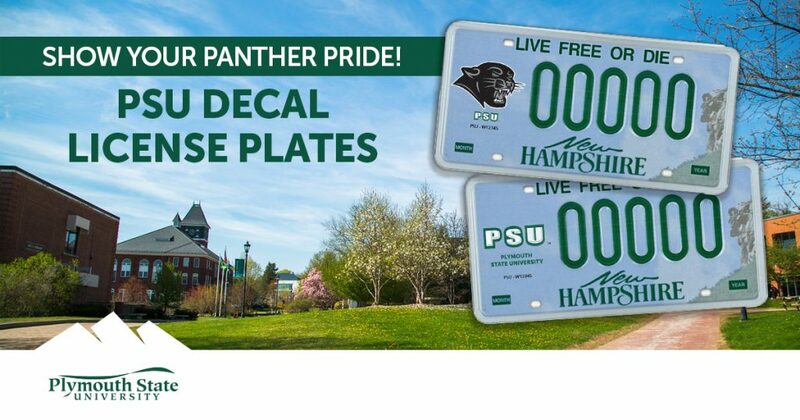 Decals are only available through PSU and decal license plates through the NH DMV. Once you have received your decal from PSU and your decal license plate from the DMV, affix the decal to the license plate and get roaring! Can I designate my gift to any area and still get a license plate decal? No, in order to receive a decal for your license plate, your gift must be designated to support scholarships for NH students. Once you obtain a decal license plate from the DMV and affix the decal obtained from PSU, you do not have to renew on a specific schedule. It is up to you how often you wish to replace your decal. But don’t worry, we will remind you as you prepare to renew your vehicle registration to consider replacing your decal too! How do I get a new decal? Please contact The Annual Giving Team at annual-fund@plymouth.edu if you still have questions about this program.